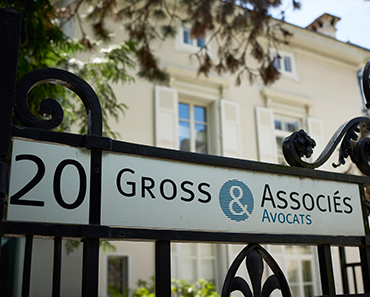 Established in 1972 for the practice of law, Gross & Associates mainly attends to the patrimonial interests of its clients, companies, public bodies and individuals, in a wide range of matters, from establishing contractual relationships to representation before all courts and public authorities, as well as negotiated settlement of conflicts. Gross & Associates maintains a personal and on-going relationship with its clients. Its policy of specialization enables the firm to offer at a reasonable cost high quality services tailored to the needs and goals of the client. The latter is closely associated with any action or decision in order to maintain the balance between the aims pursued and the means to implement. The firm has several attorneys with different training and backgrounds, capable of meeting the expectations of all our customers. Gross & Associates is a generalist firm active in most areas of law. Nevertheless, it emphasizes the specialization of each of its members. The firm immediately invested itself greatly in this project introduced in 2002 by the Swiss Bar Association. Several of its members are also particularly active in training new French-speaking specialists.